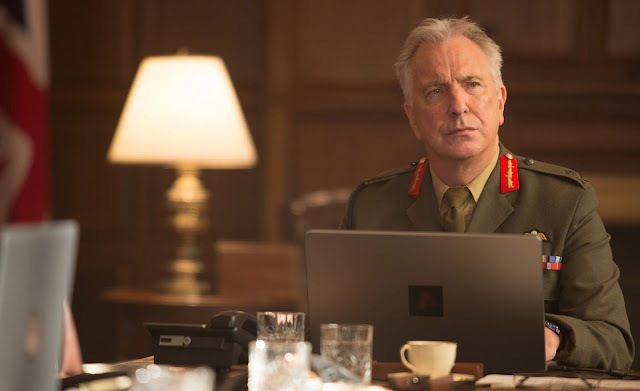 Set in the modern yet shadowy world of remotely piloted drone warfare, “Eye in the Sky” boards a top-flight ensemble cast that also includes Alan Rickman, Jeremy Northam, Iain Glen and Phoebe Fox, the film deftly explores a political, legal and moral minefield in which every decision comes at a steep price. 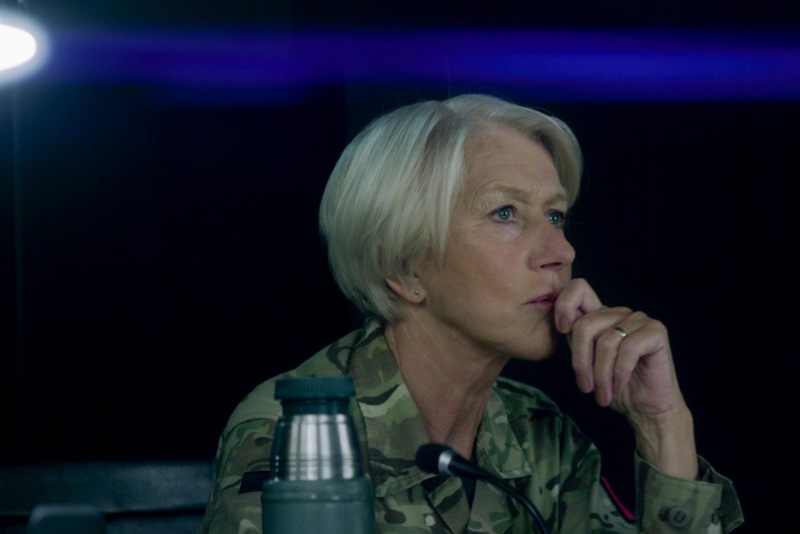 “Eye in the Sky” brings Helen Mirren in the midst of complicated mission as she plays UK Colonel Katherine Powell who is tracking a British national, Susan Danford (Lex King), suspected of working with the East African terrorist group Al-Shabaab. The operation is a complex and coordinated effort between different countries. On the ground, Kenyan intelligence operatives, like Jama Farah (Barkhad Abdi), keep an eye on the suspects. 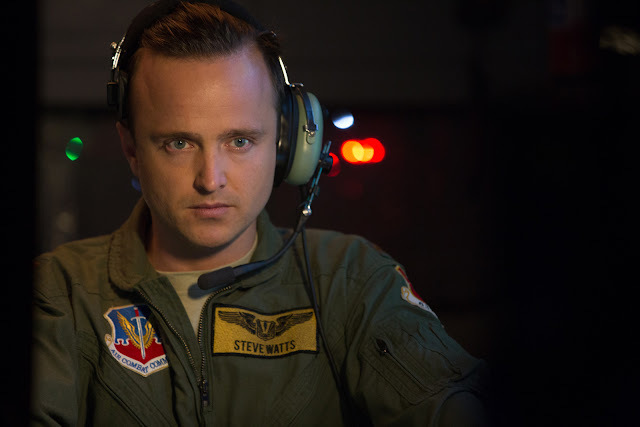 From the air, US Air Force pilots, like Lt. Steve Watts (Paul), remotely fly drones from a Nevada bunker to provide an eye in the sky. In London, Powell coordinates these various forces, as well as communicates to a panel of government officials above her. Her supervisor, Lieutenant General Frank Benson (Rickman), observes the operation remotely with a select group tasked with providing judicial and government oversight. UK Attorney General George Matherson (McCabe) adjudicates the legality of the unfolding operation, while Minister of State for Foreign and Commonwealth Affairs Brian Woodale (Northam) and Parliamentary Under Secretary of State Angela Northam (Monica Dolan) oversee the optics and ethics of the mission. Together, these figures form the ‘kill chain’, an attack structure that co-ordinates target identification and the specific force dispatched to remove the target. Following His 2007 film “Rendition,” director Gavin Hood returns to the realm of contemporary warfare with the tense thriller “Eye in the Sky.” The decision to destroy the targets is further complicated by the problem of collateral damage, which again has to be measured from afar. “Guy’s script created a very complex scenario,” continues filmmaker Gavin Hood, a South African filmmaker who counts the likes of “Ender’s Game” (2013), “X-Men Origins: Wolverine” (2009) and “Tsotsi” (2005) among his directing credits. “The script is informative in the way that it sets up the landscape, the chain of command and the way modern drone warfare is used. The collateral damage caused by a drone strike extends beyond potential human casualties. The killing of civilians, even accidentally, has a profound impact on the propaganda war. “That is a very important conversation,” says Hood. “Are drone strikes, which inevitably do result in civilian casualties, actually generating so much anti-Western sentiment that whatever success they may have in taking out a high-value individual, is offset by a growing animosity for the West? That’s a propaganda question. In war, propaganda is an extremely important tool. Are we creating negative propaganda towards the West through the use of drones?